A college degree has never been more important--or more expensive. If you're not made of money, where can you get an amazing liberal arts education without your parents having to remortgage the house or cash in their retirement fund? Which degrees will allow you to fulfill your dreams and earn a decent paycheck? What do you really need to know if you're the first in your family to go to college? How do you find good schools that offer a well-rounded campus life for black or Latino students? From the staff of Washington Monthly comes a new kind of college guide, inspired by and including the magazine's signature alternative college rankings. 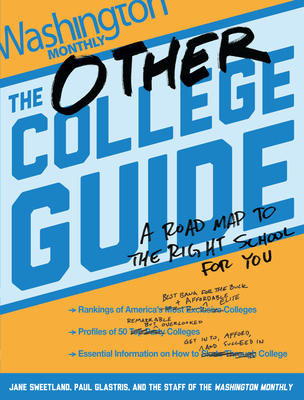 The Other College Guide features smartly designed, engaging chapters on finding the best-fit schools and the real deal about money, loans, and preparing for the world of work. This essential higher ed handbook also highlights information on what to look for (and watch out for) in online programs and for-profit colleges and concludes with fifty profiles of remarkable but frequently overlooked schools. All things being unequal, The Other College Guide will provide American students--and their families and school counselors--with the honest and practical information they need to make sense of the college process and carve a path to the future they imagine. Paul Glastris was special assistant and senior speechwriter to President Bill Clinton for three years, during which time he wrote over 200 speeches for the president on subjects ranging from education to health care to the budget. Glastris was also co-creator of the president's "DC Reads this Summer" program. Before joining the White House, Glastris spent ten years as a correspondent and editor at "U.S. News & World Report."